These kits are the ultimate solution for people who want high power and top range using a rack battery configuration. 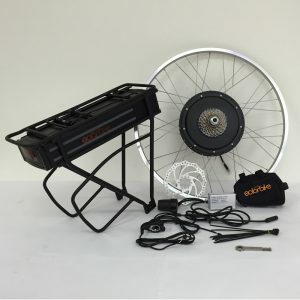 The kits are available in 26″ and 700c rim size for either the front or rear wheel. It’s extremely difficult to get such a high capacity battery for an electric bike that’s able to withstand the high current draw of the 1000W kits. The new PANASONIC cells with the unique custom double layered rack is able to do this. 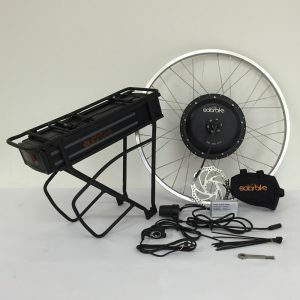 These kits have everything needed to convert a regular bicycle into a high powered electric bicycle. If you’re choosing the front wheel then you should have rigid steel forks, otherwise it’s better to put the kit on the rear. Ensure you put the torque bar on in either case because the motors have a lot of torque and need to be supported. 200W is the legal limit for riding on the road.